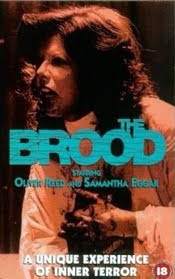 While not perfect, The Brood is Cronenberg's finest pre-Videodrome work, and can probably be thought of as his most generally 'Cronenbergian.' It has the human body being altered through the power of the mind, creepy reproductive/sexual undertones, and Robert Silverman. Partially inspired by the director's own brutal custody battle, the film tells the story of a family torn asunder by its emotionally unstable matriarch, who has been whisked away by a radical psychotherapist who is more interested in using her to advance his research than actually curing her. 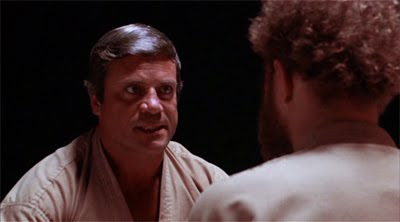 The late, great Oliver Reed: England's heaviest drinking thespian plays the ethically challenged super-psychiatrist responsible for Psychoplasmics. For the most part it's a soft spoken role couched in rationality and passive-aggressive therapist talk, but he really takes off during the roll playing sessions involved in his radical treatments. The film begins with him and a simpering patient demonstrating Psychoplasmics for an audience in a manner strongly reminiscent of Kabuki theater. 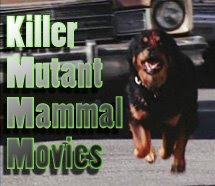 (A style Cronenberg would later explore in his adaptation of M. Butterfly.) With accelerating anger, Reed plays the role of the patient's father, emasculating and humiliating him until the rage manifests as gross boils all over the man's body. 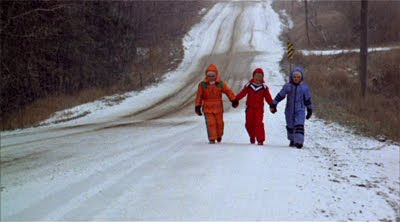 Plus, we get to see exactly how many children it would take to down the famously pugnacious actor: The Kindergarten Beatdown: In the second most shocking scene in the film, a kindergarten teacher with the absolute worst haircut late '70s Canada has to offer gets singled out by a pair of snowsuit clad broodlings when their "mother" begins to see the woman as a rival for her ex-husband's affections. Passing for kids at a distance they easily sneak into the classroom and arm themselves with little wooden hammers. They then proceed to beat the teacher to death (not an easy task, considering their size and weapon choice) in front of all her students. Some of the kids' "traumatized" faces are absolutely priceless. (Imagine the therapy bills. Yikes) The Laid Back Canadian Police: Not only does the sudden appearance of brutal midget murderers get no reaction from the cops other than "We weren't looking for anything that small," but the coroner explains the inner workings of a dead broodling with the calm demeanor of someone who autopsies previously unknown species of mutant children all the time. They even let the civilian protagonist sit in on the affair. "Oh look, some sort of grotesque midget monster with no belly button and a life sustaining nutrient pouch to make up for the lack of a digestive system. That's probably the scientific discovery of the decade, if not century. I'd better calmly explain it to the son in law of the people it murdered instead of frantically calling National Geographic or the Weekly World News. Man, I'm hungry. I wonder what's on TV right now?" 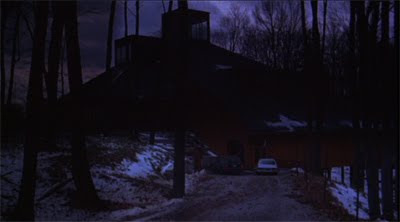 Note to Minnesota folk: don't forget to check out the last Cronenberg screening at the Trylon Microcinema this weekend. It's The Fly! Just wanted to thank you from the bottom of my heart for throwing up that kindergarten screen cap so I didn't have to spend a million hours grabbing it from my VHS copy. I think we can all see why I quit acting.